The relationship between the pressure inside a cylindrical mock vessel and the change in radius is called radial compliance. It has been postulated that it is the internal change in radius with pressure that has a significant effect on blood flow disturbance or the interaction of a graft or synthetic tube with an indwelling stent or catheter. [1, 2] A variety of techniques are widely used in determining this parameter. Some are direct measurements of the internal diameter and some methods measure the outer diameter along with the use of theoretical calculations in determining this parameter. It is essential to understand and evaluate all the techniques widely used in the cardiovascular industry. This research work is an effort towards making this comparison. The effectiveness of in vitro experiments on medical devices like stents or grafts depends significantly on the distension of the mock arteries into which they are deployed. It is this parameter that determines the load being applied to the medical device. Radial distension of a mock artery depends on the radius of the artery and also on the internal pressure to which it is pulsed. [3-6] There are three common approaches, optical, mechanical and theoretical which are widely used in the cardiovascular industry in determining internal diameter. The most commonly used practice in the industry is to measure the change in internal diameter directly. 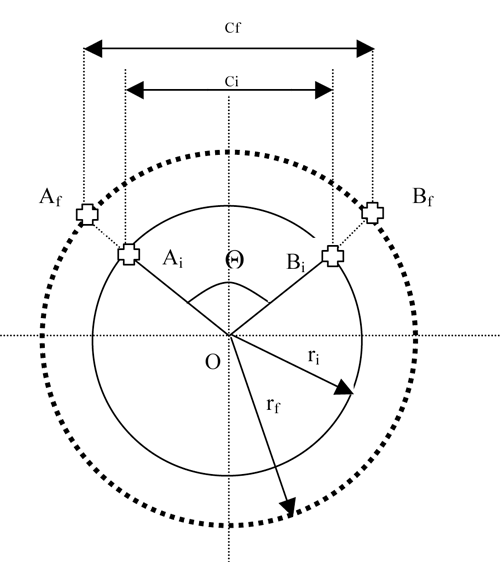 Another method is to calculate the change in internal diameter by monitoring the change in outer diameter and using it along with theoretical equations from linear elastic mechanics. In this study, a single silicone mock artery was tested at 72 bpm and its distension was measured using four commonly used techniques. High speed photography and laser micrometry were used in the optical approach, dynamic internal compliance testing (DCT2) was used in the mechanical approach, and equations relating to the inner and outer diameter based on linear elastic mechanics were used in the theoretical approach. A silicone mock artery (OD=24.87mm, ID=21.10mm, length=10cm) was selected for this experiment and was retested three times. In each case, internal and external diameters were either measured or calculated at 0mm Hg and then 140mm Hg. Initial external and internal diameter and wall thickness were measured using a LaserMike 183 (LaserMike, Dayton, OH). Two points were marked on both the inner (16.36mm apart) and outer (16.57mm apart) diameters of this mock artery to assist in tracking. The silicone mock artery was tested in a DCT2 (Dynamic Compliance Tester DCT2, Dynatek Dalta Scientific Instruments, Galena, MO) for radial compliance. [1,2] Simultaneously, a Laser Micrometer LS7600 (Keyence Corp, Woodcliff Lake, NJ) was used to monitor the change in external diameter, while a high speed photographic camera (Fast Cam PCI 1280 Camera with Photron Motion Tools Software Version 1.05, Motion Engineering, Indianapolis, IN) was used to monitor both changes in internal and external diameter. The various techniques and devices used, and the information obtained from each are summarized below. The DCT2 is equipped with a speed controlled DC motor. This motor turns a shaft which is in conjunction with an adjustable eccentric coupler. This coupler along with a crank arm converts the rotational motion into linear motion. This linear motion is used to move a drive rod, which in turn compresses a bellows. During the test setup, the mock artery is fixed in the DCT2 machine such that one end is attached to the discharge end of the bellows and the other end is fixed to a manifold to which a pressure transducer is attached. Where Vi is the volume at 0 mm Hg pressure. Method using high speed photography [8-10]: A high speed photographic camera was used to determine the distension of the mock artery. Its associated tracking software has the capability of analyzing the fast motion within the captured image. The basic principle for distension measurements using high speed photography is as follows: The high speed camera will track the markings placed on the diameter of the mock arteries. The relative distance between these markings changes as the tube expands. The percent change in the chord length will be the same percentage change that occurs in the diameter and circumference. The DCT2 measured the change in internal diameter with change in internal pressure. Thus compliance and, in turn, distension of the silicone mock artery was calculated and tabulated in Table 2. The two markings on both inner and outer diameters of the mock artery were tracked using the automated tracking function provided by the camera software and the data points were exported to a spreadsheet. Strain in the chord length was measured and percentage of distension was calculated for both inside and outside of the mock artery as shown in Table 3. The percentage distension was used in calculating the final inner and outer diameter of the mock artery. The camera outer diameter measurement was used along with the linear elastic mechanics equation in calculating the pressurized inner diameter of the mock artery and tabulated as shown in Table 4. The change in external diameter due to a change in internal pressure was monitored by the laser micrometer. The external distension was then calculated and tabulated as shown in Table 5. The outer diameter measurement was used along with the linear elastic mechanics equation in calculating the pressurized inner diameter of the mock artery and tabulated as shown in Table 6. In this study, the high speed photographic camera is the only device capable of measuring distension both on the inside and outside of the mock arteries. From Table 3, which shows the measurements from the camera, it can be seen that outer distension is always lower than inner distension. Considering Table 3 and Table 5, it can be seen that percent outer distension as measured by the high speed camera is 0.8% less than that measured by the laser micrometer. Table 7 gives a summary of measured and calculated values of both final inner diameter and inner distension using various techniques. The magnitude of the variations between techniques can partially be explained by the differing levels of resolution or precision in each method. The dynamic compliance tester has the best precision with respect to instrumentation, but is an indirect measurement of the wall distension. The camera and laser micrometer have lower resolution. In our hands, we have become very confident in the data from the dynamic compliance tester, but in some cases would prefer to use the laser or camera techniques. Figure 2 shows the graphical representation of the variation in inner distension using the various techniques. Considering the repeatability error and other performance specifications of the measuring devices, the percentage of inner distension measured by all the devices using various techniques are comparable if the variability that was found is acceptable in any specific situation. If greater agreement between the dynamic compliance tester results and the laser- or camera-driven results using the equations of linear elastic mechanics is needed, then a closer correlation could be found empirically through a reconsideration of the Poisson’s ratio used in the equations. However, this does not address the next question: Does the medical device experience the same distension as the mock artery? To answer this question, further experiments and analyses are ongoing using the high speed photographic camera, which can monitor the motion of the device as well as the wall.